In 2014, a controversial exhibition and auction of street pieces by the famously anonymous British graffiti artist Banksy happened in London. Because the art had been removed from buildings upon which the cheeky artist had illegally stencilled them, the exhibit, which was not authorized by Banksy, was audaciously titled Stealing Banksy. Four years later, however, an accusation has been levelled that suggests “Stealing Banksy” might be an appropriate nickname for the possibly pilfering artist himself. Toronto-based illustrator Cinders McLeod has taken to social media to allege the ideas behind a couple of Banksy’s iconic pieces had been “pinched” from her. And while she’s a fan of his work and was initially flattered by Banksy’s alleged imitation of her style, McLeod’s grievance has now gone from a simmer to a boil. “We are told women aren’t political cartoonists," said the Canadian-born McLeod, who lived and illustrated in Scotland from 1992 to 2001 for publications such as The Scotsman and the Glasgow Herald. “I struggled for years to be a political cartoonist and to be accepted as one." To then have a man come along and possibly use her work as his own is upsetting, she adds. That’s especially true because the alleged theft speaks to the patriarchal nature of political cartooning and the way women, both in their representation and work in the realm, are not valued, she says. The entire form of expression is dominated by men. The artists are usually men, the editors and publishers who hire them are often men and the politicians to be lampooned have traditionally been men. And, so, sexist myths were institutionalized: Women don’t have a sense of humour. Women don’t care about politics. A woman’s place is in the kitchen – hey, let’s draw the angry wife in a bathrobe and curlers with a rolling pin in her hand. 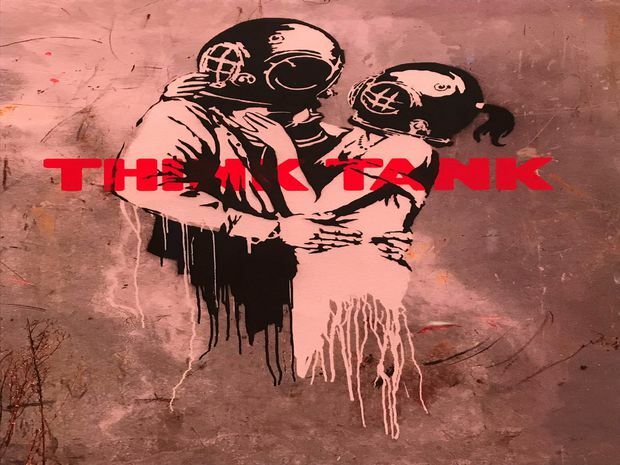 The works in question include Banksy’s Deep Sea Lovers, which prominently adorns the cover of the 2003 Blur album, Think Tank, a chart-topper in Britain. 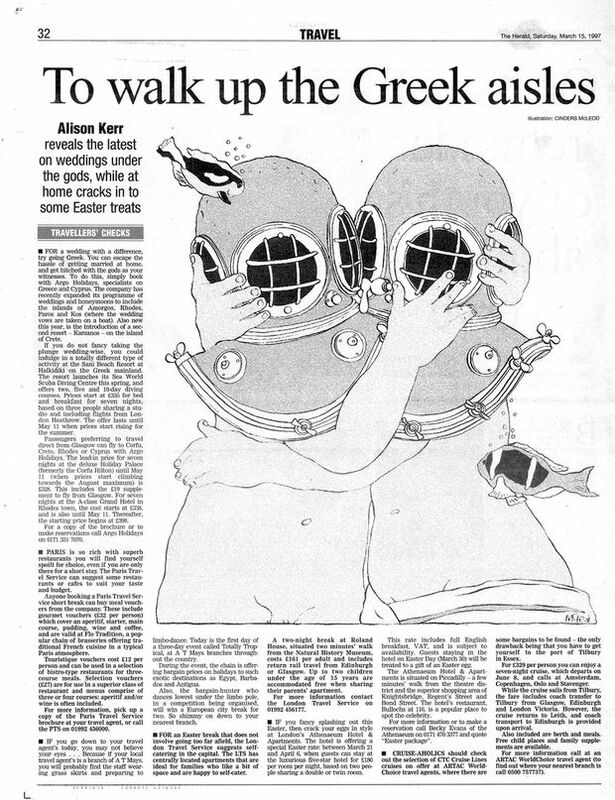 That illustration, of a man and a woman in a romantic embrace wearing clunky deep-sea diving helmets, bears striking resemblance to something drawn by McLeod in 1997 for the Herald. 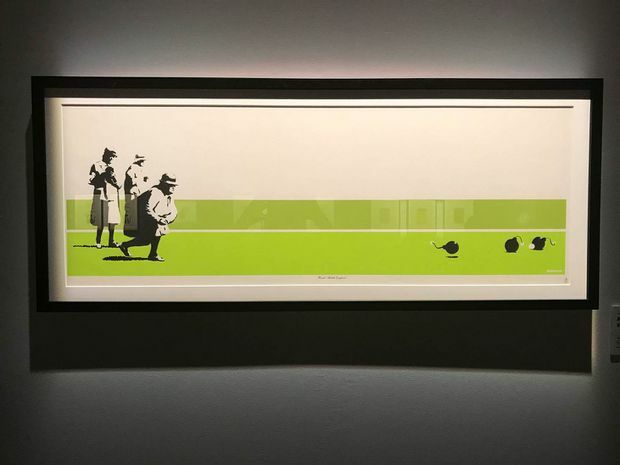 The other is Banksy’s 2003 silkscreen Bomb Middle England, which depicted an older lady lawn-bowling with lit bombs. McLeod had the remarkably similar idea years earlier. She called it Anarchic Granny and it was published in the Herald in 1999. The earlier Cinders McLeod illustration. Upon her return to Toronto in the early 2000s, she worked at The Globe and Mail as a designer and illustrator. Currently, she authors and illustrates a series of children’s books on financial literacy for the piggy-bank set called Moneybunny. This summer, in a warehouse in Toronto’s west end, the Art of Banksy exhibit (co-curated by Banksy’s former manager and friend Steven Lazarides, and, as with Stealing Banksy, organized without the participation or consent of the secretive artist himself) is drawing big crowds. 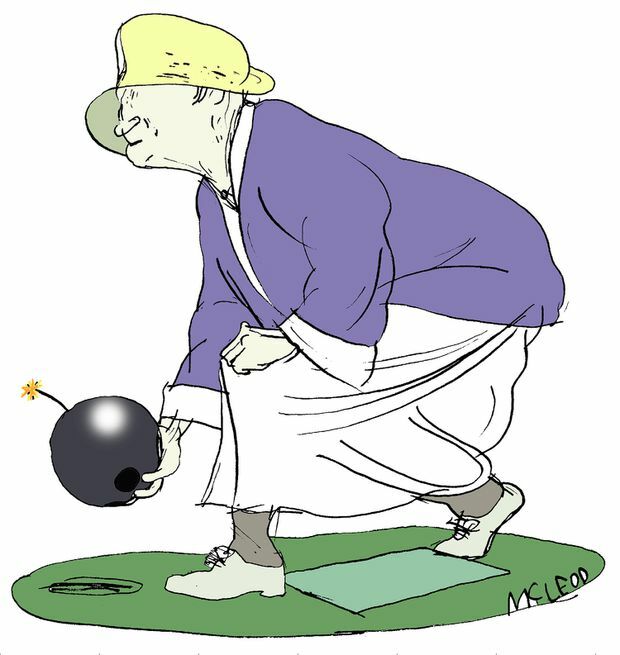 Seeing a TV news clip on the exhibit that showed Banksy’s elderly lawn-bowler, McLeod was struck by the conceptual similarities the piece had with her own Anarchic Granny. She was third in line with her daughter on the opening day of the exhibit. “That’s how much I like the guy,” said McLeod, who never noticed echoes of her work in Banksy’s previously. “I really believe in his medium and his message.” Still, McLeod was in a combative and mischievous mood upon leaving the exhibit. Returning home, she began tweeting her frustration: “So I went to the Banksy Toronto show today and discovered either great minds think alike, or the woman cartoonist thought of it first,” one of her trolling social-media missives read. To illustrate her point about the patriarchal nature of cartooning, McLeod tells a story about a male editor at The Scotsman who cut her long-running cartoon shortly after she’d given birth to her daughter. In fact, McLeod was breastfeeding her when the editor dropped the bad news during a lunch meeting. “When I asked him to reconsider, he looked at me scornfully and said, ‘We are not a charity.'" For McLeod, it was a pure Dickensian moment. At the Herald, a male editor suggested McLeod put a man in her Broomie Law strip. She told him a man wasn’t needed, but joked she had considered a nagging husband. The editor was not amused; the cartoon was cut. Great artists steal and so to do burglars. In June, a piece valued at $45,000 was stolen from the pop-up warehouse gallery holding the Toronto exhibit. A stolen Banksy? Perhaps the justice is poetic.